If you've ever had to tend with a warped, stuck wooden tilt-up garage door, welcome to paradise. 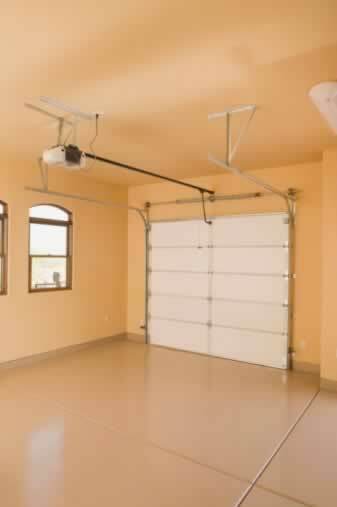 Today's sectional roll-up garage doors are easy on the eye and easier on your back. An electric motor raises and closes these panels with ease, and the roll-up door stores conveniently in the frame beneath the ceiling. There are no doors to open into the garage, freeing up workspace or storage room. Unlike tilt-up models, there's no compromising head room when you install roll-up doors. Who wants to climb out of their car on a 100 degree summer day or a rain-swept night in November? Low-maintenance, roll-up doors are installed in a snap, require little maintenance, and await your command from a remote controller.